Featured / Recipes / 07.10.2017. Fuži pasta, prosciutto and truffles are gastronomical synonyms of Istria. 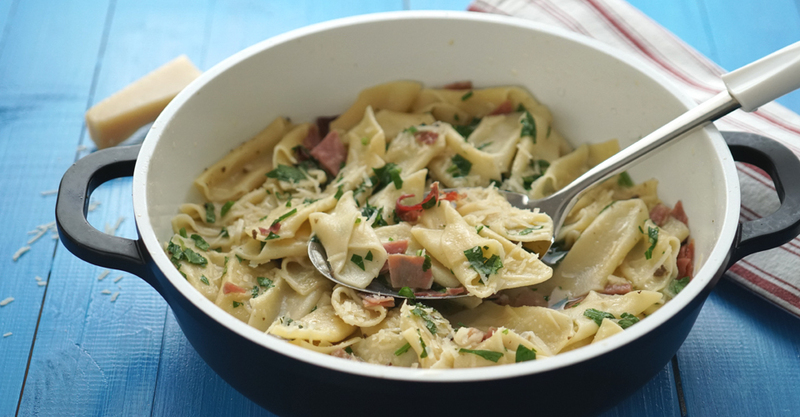 Home-made pasta in the shape of a spindle, prosciutto cured and dried on storm wind, the treasures of the Motovun forest, blended in a meat and butter stock, with added parsley and grated sheep cheese. Tasty perfection on a plate. Sieve the flour into a wide bowl. Add eggs, oil, wine, salt and with some water prepare a smooth pastry. Leave it to sit for about half hour. Roll the pastry thinly, then cut in stripes 4 cm/1.57 in wide, and then cut them into squares of the same dimensions 4 cm/1.57 in. Form fuži so as to fold the opposite ends over a handle of a wooden spoon and roll so the ends would fold together and form a hollow pasta – fuži. Distribute them on a floured board and leave to dry for a while. Cook in hot, salted water for 5 minutes. Cut the prosciutto on long stripes, and then to cubes. Chop the parsley. Melt the butter in a wide dish, add prosciutto and truffles in oil. Mix and pour meat stock. Add salt, pepper and parsley. Stir in the boiled fuži. Serve fuži with grated sheep cheese.